NEW ORLEANS — Two weeks ago we unveiled the finalists for the 2016 The Bowerman Award. 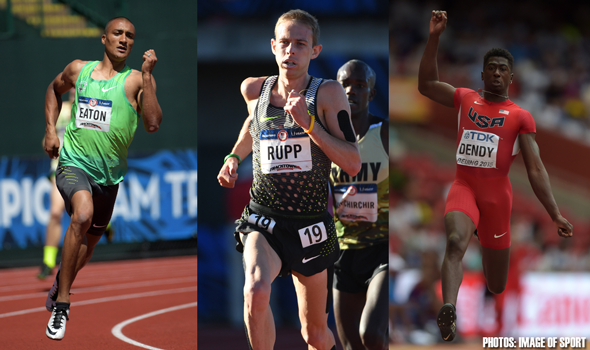 Last Friday the fun continued as we revealed the winners of The Bowerman Award Fan Vote. With the 2016 U.S. Olympic Team Trials – Track & Field in full swing, let’s take a look back — specifically to see how former winners of The Bowerman Award successfully navigated the Road to Rio. Back in February, Galen Rupp secured his spot on the U.S. Olympic Team with a victory at the 2016 U.S. Olympic Team Trials – Marathon. It was a smashing 26.2-mile debut for Rupp as he won by more than a minute (2:11:12 to 2:12.20). Then on July 1, Rupp returned to the track and continued his dominance at 10000 meters. Rupp won his eighth consecutive title at that distance, dating back to the 2009 USATF Outdoor Championships. This was Rupp’s fastest winning effort (27:55.04) since the 2012 U.S. Olympic Team Trials (27:25.33) and fifth victory in front of his home crowd at Hayward Field. There is also a strong possibility Rupp could qualify for the 5000 in Rio. He finished 12th in qualifying on Monday ahead of Saturday’s final at 9:20 p.m. ET. Ashton Eaton is back to his old tricks again. The World’s Greatest Athlete made quick work of the decathlon this past weekend as he won with a total of 8750 points, 325 more than runner-up Jeremy Taiwo and 337 more than third-place Zach Ziemek. Eaton scored more than 1000 points in three events — 100 (10.34), long jump (7.84m/25-8¾) and 110 hurdles (13.60) — and posted a winning mark in the 400 (46.30). The second ever men’s winner of The Bowerman Award will look to capture his seventh consecutive world championship in the combined events. Included in that tally is an Olympic gold medal in 2012 and a world record score of 9045 that he set at the 2015 IAAF World Championships. Marquis Dendy found himself in a precarious position during Sunday’s long jump final. Through two rounds, Dendy sat in 10th place with a mark of 7.75m (25-5¼) and a foul to his credit. If Dendy wanted to punch a ticket to Rio, he needed to finish in the top-3 or hope everybody in front of him didn’t hit the Olympic standard. Well, Dendy soared 8.42m (27-7½) on his third attempt and moved into second place. One round after that, Jarrion Lawson took over second and then Will Claye pushed Dendy to fourth in the fifth round. Based on prior marks, Dendy had to hope Claye wouldn’t hit the wind-legal Olympic standard of 8.15m. If Claye did, Dendy would be left on the outside, looking in. Needless to say, the wind wasn’t in Claye’s favor and Dendy earned a spot on Team USA. Jenny Barringer (Simpson), 2009: Will contest first round of 1500 meters on Thursday, July 7. Queen Harrison, 2010: Will contest first round of 100 hurdles on Thursday, July 7. Jessica Beard, 2011: Finished 17th in qualifying for 400 meters (52.52). Did not make the semifinals. Kimberlyn Duncan, 2012: Will contest first round of 200 meters on Friday, July 8. Brianna Rollins, 2013: Will contest first round of 100 hurdles on Thursday, July 7. Laura Roesler, 2014: Finished 20th in qualifying for 800 meters (2:03.55). Did not make the semifinals. Jenna Prandini, 2015: Finished fifth in 100-meter final (10.96). Will contest first round of 200 meters on Friday, July 8.